Mascher Space takes over High Tide Gallery! Join us Friday, May 4th from 6pm-9pm for a night of time-based works. 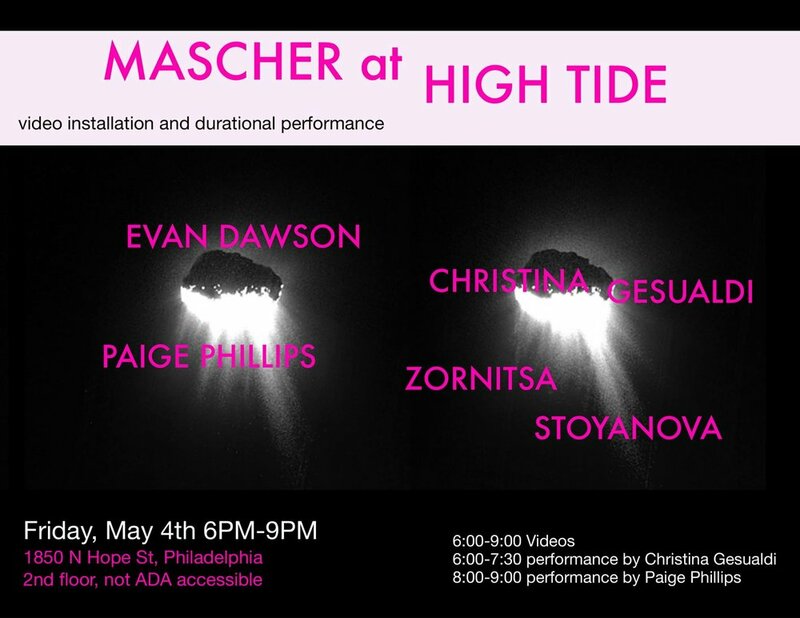 Envisioned as an exchange between Mascher Space and High Tide Gallery, both cooperative run art spaces based in Fishtown, this exhibition features Artist in Residence and friends of Mascher. Three films will be on display throughout the evening, all of which explore imagery that is doubled in some way. From 6pm-7:30pm, there will be a solo performance by Christina Gesualdi in which she manipulates material; from 7:30pm-8pm, the outcome of the material can be viewed as installation. The night culminates with an improvisational movement score by Paige Phillips, performed by Josh Hines and Kelly Hurlburt, guest artists based in Columbus, OH. Evan Dawson is a cross-disciplinary artist bridging cross-cultural experiences through acute attention to the material circumstances of daily life. Working with duration, habit formation, and collections of found materials, the works often take on performative and collaborative structures in their search for poetic justice. He received his MFA in Sculpture from The Ohio State University and most recently is a 2018 Wind Challenge recipient at Fleischer Art Memorial in Philadelphia. You can view his work at www.evandawson.info or follow in process work @evncdawsn. Christina Gesualdi is a Philly based dance, choreographer, and movement educator. She is an artist in residence at Mascher Space Co-op. Christina is a member of the Philly Tenants Union. She is an advocate for DIY, small scale cooperation, collaboration, and community exchange in Philly's dance community. She is also a yoga teacher who loves teaching senior citizens, undergraduates, and experimental movers. She has performed with Curt Haworth, <fidget>, Annie Wilson, Nicole Bindler, Meg Foley, PIMA Group, and Zornitsa Stoyanova - [Here]begin Dance. Finally, "YES to the way dancing bodies can breed pluralism and anti-absolutism."